Spicy, hearty mushroom lettuce wraps – you won’t miss the meat one bit. If you’ve been hangin’ out with us for a while you already know that my daughter is vegan. I honestly thought that it was going to be a phase – but, it’s been two years now and she is still as committed as ever. Over the last two years, she has changed the way our entire family eats and the way that I plan food. Her commitment has shown me how one person can create big change. Cooking for a family with different food preferences can be challenging. I’ve had to figure out how to get everyone fed, get enough protein and keep things vegan adaptable and gluten-free. Wow, that’s a lot of things to consider! Take heart – with a little bit of planning it doesn’t have to be that hard. 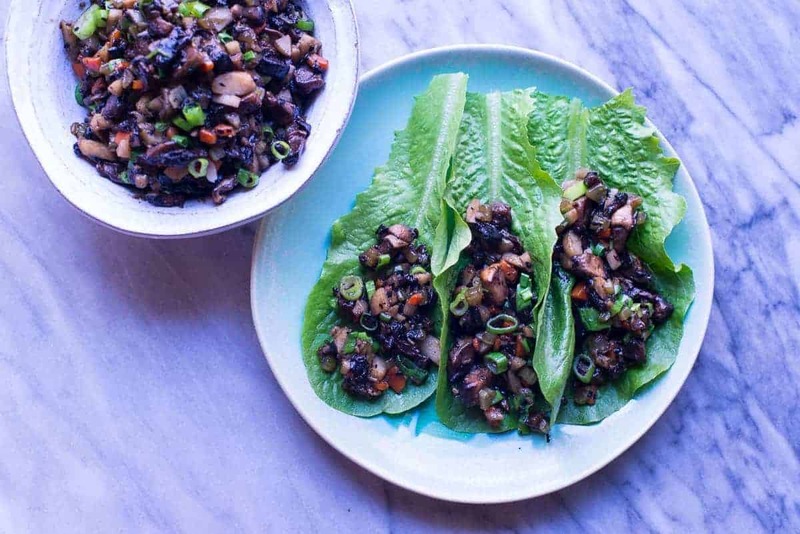 Crunchy, spicy, and full of umami – these mushroom lettuce wraps are a win for everyone. This recipe will satisfy meat lovers and veg heads alike. The portobello mushrooms are hearty and have mad umami. The cashews and water chestnuts give these spicy Asian style wraps a little crunch. If you need a little extra protein you can easily serve this with some teriyaki chicken. Check out the recipe for my Teriyaki Chicken Beast Bowl. This is the perfect opportunity to think about re-purposing your protein. You can make a batch of teriyaki chicken and a batch of mushroom wraps and you’ve already done meal prep for two meals this week. Bam – it’s Meal Prep 101. This makes enough filling that you can easily eat this all week. How can we help make 2018 easier for you? If you could leave us a comment and let us know what you would like to see this year we would really appreciate it. Do you need easy recipes? Family recipes? Meal plans and shopping lists? We are really working hard to build Beast Bowls into your go-to place for recipes. We want to know what we could do better. Your support is much appreciated – following us on your favorite social media helps us to grow our reach; so, show a little love ❤ and Follow Us. 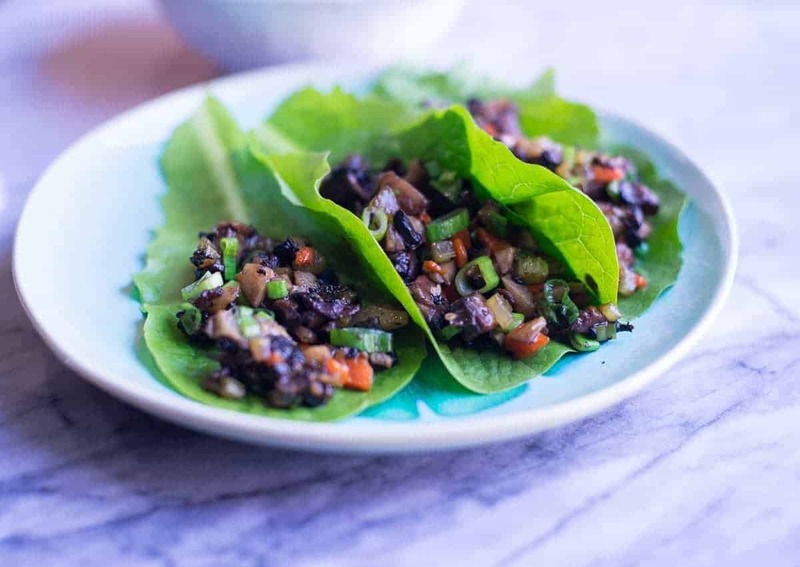 These Spicy Asain Portobello Mushroom Wraps are full of umami. They are hearty enough for meat heads and veg heads. Sauté the mushrooms, on medium high, in a heavy bottomed skillet with coconut oil and a little salt. When the mushrooms are browned nicely remove them from the pan and set aside. Add celery, carrots, the whites of the green onions, ginger and garlic. Sauté until fragrant. About 4 minutes. Add the Mongolian fire oil, tamarind, rice wine vinegar, and maple syrup. Add tofu, water chestnuts and cashews. Return the mushrooms to the pan. Mix the water and cornstarch together in a small bowl. Make a well in the center of the pan and add the cornstarch slurry. Bring liquid to a boil. The sauce should thiken and be nice and glossy. Remove from the heat and add cilantro, greens or the onions, and sesame seeds.